Today we complete our look at the various illustrations of Mughals painted by French artist Racinet in the 19th century. Above is a scene of three Mughal women dancing, and as the original French description states, they are actually imitating the pastimes of Krsna and the gopis. One woman, in a headpiece with feather, is taking the role of Sri Krsna, while the other ladies dance as the gopis. As mentioned yesterday, many such forms of Krsna lila imitation are found in depictions of the Mughal courts. In the images to follow, we see a host of Mughal Emperors and royal personalities depicted by Racinet in his Le Costume Historique. 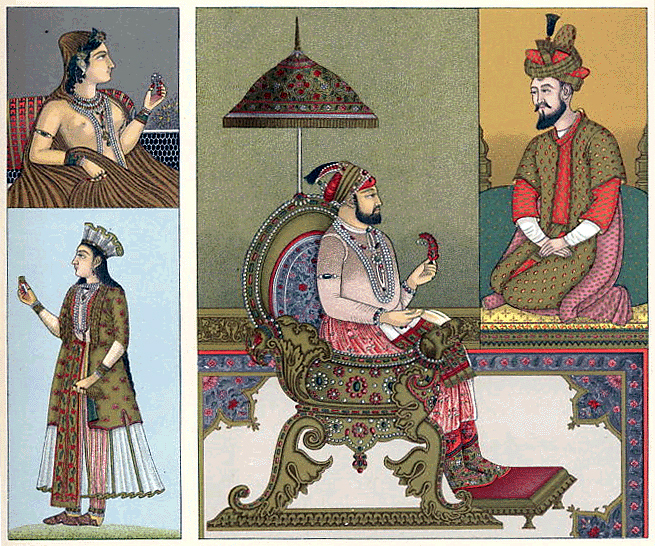 In this image, Emperors Babur and Humayun are depicted in very recognizable style. The Mughal women in the panel at left are presumably representations of consorts of the Emperors. The woman above is shown with her face and upper body adorned with saffron dye. She appears to be holding a piece of jewelry. The woman below holds a small square object, which may be the saffron cosmetic itself. 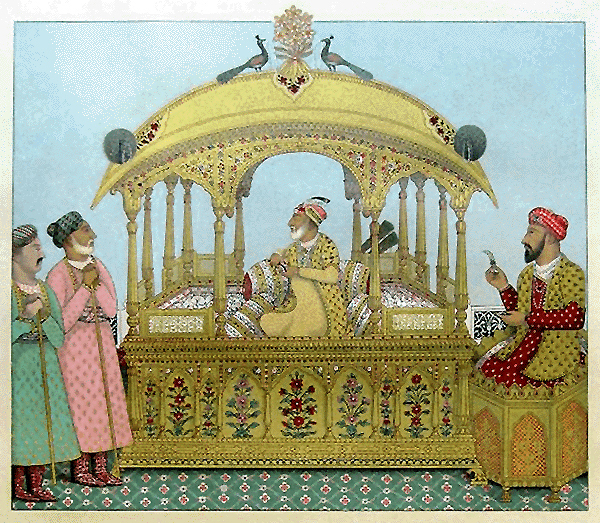 Shown above are two more famous members of the Court of the Grand Mogul – Emperors Akbar and Jahangir (Djehanguir). These Mughal courts were unimaginably rich, having stolen the wealth of a large portion of Hindustan. Akbar is shown sitting on an Indian style asana, wearing a simple costume with a pearl and diamond turban, and holding a feather. Emperor Jahangir is depicted sitting on his ornate throne beneath a parasol – another example of the Mughal style of imitating the Deities themselves. His clothing is typical of fine Deccan cotton, while the throne, rug and railings are all Persian. The Mughal women are beautifully dressed and ornamented. Their head scarves are thin muslin, robes are made of cotton from Dacca, and their trousers are embroidered Kashmiri silk. This image of a Grand Mogul on his throne was done as a miniature in the 17th century. The predominant motif of the ornamentation is the peacock, with four on the roof of the pavilion, feather fans at the rear, and a subtle peacock pattern in the rug. There is also a feather in the royal's turban, again reminiscent of Sri Krsna's dress. Of the three persons in attendance, the one seated is likely the Emperor's prime minister. Pictured above (at left) is Mourad Bakche, imperial prince and son of Shah Jahan, the 5th Mughal Emperor and brother of Aurengzeb. 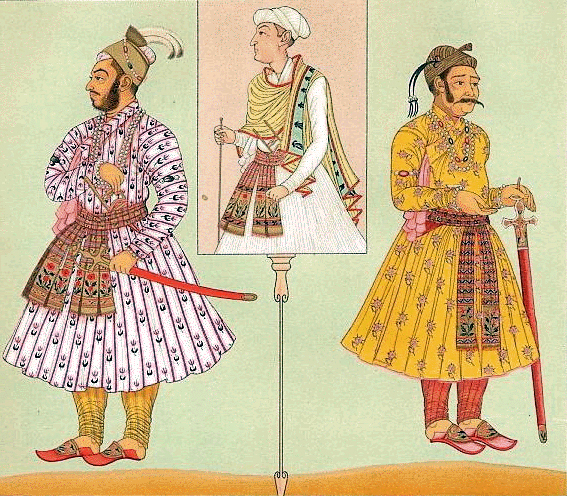 On the right is an Indian prince from the 17th century, and at center is a Delhi sovereign. This picture of Mourad Bakche is another reminder of the fact that the Mughal invaders were not a disparate group of intruders – they were all members of the same family. In successive generations, they stole the wealth of India, destroyed her temples, and subjugated her people. Such a long lineage of despots is reminiscent of the families of demons described in Srimad Bhagavatam. 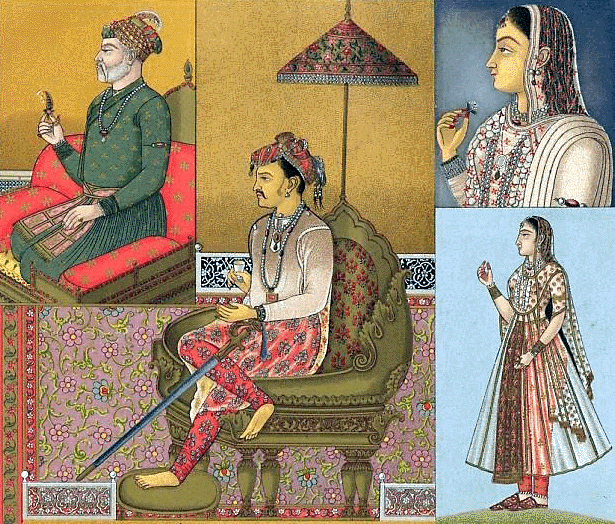 Another group of Mughal royals from the Late Mughal period, depicted with shield and kounda, a straight saber in velvet-covered sheath. 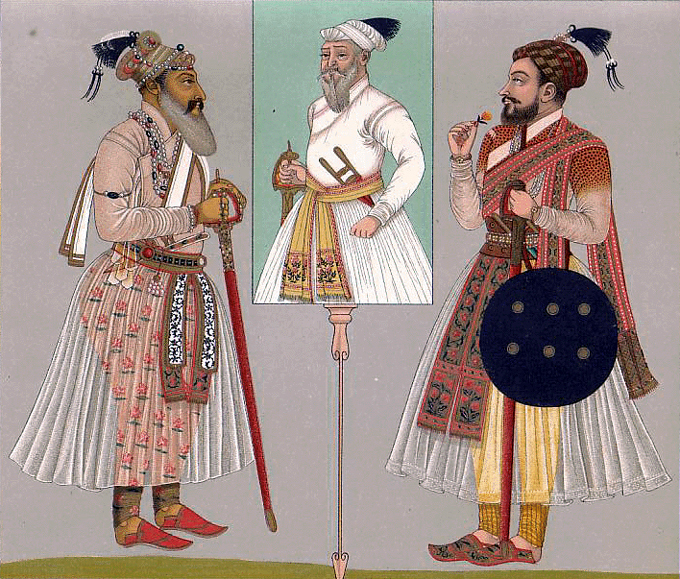 The individual on the right is dressed in a style somewhat reminiscent of the Indian Rajputs, although his turban and curved slippers are decidedly Persian.